Christian Ivan Villanueva…his all-time favorite baseball player is Chipper Jones...roots for Real Madrid...originally signed by Rangers scouts Bill McLaughlin and Mike Daly. Spent the majority of the season with El Paso while making his MLB debut with SD... With El Paso, produced a .296/.366/.515 slash line...led the club with 86 RBI and his ranked second in doubles (28) and third in walks (43)…also logged 50 extra-base hits... Started in all eight playoff games with El Paso and hit safely in six of the eight games, hitting .290 (9-for-31) with two doubles and two RBI... Produced a .344/.344/.750 slash line in 12 games with the Padres…logged five extra-base hits, four of which were home runs with one double... Recorded his first ML hit on 9/20 vs. ARI (a single in the second inning) and his first ML home run in the fifth inning…proceeded to hit safely in five of his next six starts, hitting .333 (8-for-24) with four home runs, six RBI and five runs scored... His first ML home run came in the third inning on 9/20 vs. ARI, an inning after teammate Rocky Gale also hit his first career homer... became just the second Padre rookie duo in club history to record their first big league home runs in the same game (first: Sandy Alomar Jr. and Phil Stephenson on 9/30/89 vs. SF), per ELIAS... The next day on 9/21 vs. COL, Villanueva recorded his second career multi-hit game and his first career multi-RBI game...before his homer, Franchy Cordero was the last Padre rookie to homer in consecutive games following the first of his career (6/12-13 of this season), per ELIAS... Hit his third and fourth homers on 9/24 vs. COL and 9/26 at LAD…among players who made their MLB debuts in 2017, he was the only player to hit four home runs in their first nine career games…he was the third Padre to ever accomplish the feat, joining Hunter Renfroe (2016) and Yasmani Grandal (2012)... In his 12 MLB games from 9/18-10/1, Villanueva's .344 average was the second-highest among NL rookies and fourthhighest among all ML rookies…his four home runs were the most among NL rookies and fourth among ML rookies. Christian Villanueva began the season with Double-A Tennessee before being promoted to Triple-A Iowa on April 17 … batted .257 (123-for-479) with 61 runs scored, 23 doubles, 20 home runs and 95 RBI in 129 total games ... led Iowa in RBI, home runs and doubles. Posted a .208 mark (5-for-24) with two home runs and seven RBI in six games with Tennessee before being promoted. Spent the remainder of the season at Iowa, hitting .259 (118-for-455) with 56 runs, 23 doubles, 18 home runs and 88 RBI in 123 games. Drove in a career-high five runs, April 25 at Colorado Springs, going 2-for-4 with a three-run homer. June 1 at El Paso, went 3-for-5 with a double, triple, homer, three runs scored and three RBI ... homered in four-straight games, June 1-4. Twice named PCL Player of the Week: June 1-7 (.333, 4 HR, 12 RBI) and July 13-19 (.533, 2 2B, 3 HR). Batted .294 (42-for-143) with eight home runs against southpaws compared to a .244 mark (76-for-312) with 10 home runs against righties. Went 30-for-103 (.291) with five doubles, six home runs and 21 RBI in 27 July games. Recorded a season-high four hits May 22 and May 24 vs. Tacoma. Posted his lone multi-homer game of the campaign on July 17 vs. Memphis. Was 5-for-11 with three RBI in extra-inning games. Christian started the year with Triple-A Iowa, appearing in 64 games before being sent to Double-A Tennessee in mid-June...All told, batted .230 (105-for-457) with 53 runs scored, 38 doubles, 10 home runs and 58 RBI in 126 games this season...Posted a .211 batting average (47-for-223) with 18 doubles, six home runs and 26 RBI in 64 games with Iowa...Drew 21 walks while fanning 64 times...Batted .265 (13-for-49) with five doubles, two home runs and 20 RBI with runners in scoring position at Iowa...Was 7-for-20 (.350) with 13 RBI against Triple-A foes with runners in scoring position and two outs...Logged a season-best seven-game hitting streak with Iowa, May 2-10, going 10-for-27 (.370) with three doubles during the stretch...Went 2-for-4 with two home runs and three RBI on May 21 at Round Rock...Drove in a season-high five runs on June 9 at Fresno, going 2-for-4 with a two-out, sixth-inning grand slam in Iowa's 17-2 rout...Sent to Tennessee in mid-June, and made his season debut at the Double-A level on June 19 vs. Chattanooga, going 2-for-5 with a RBI...Hit .248 (58-for-234) with 20 doubles, four home runs and 32 RBI in 62 games with the Smokies...Recorded a .289 average (13-for-45) against southpaws compared to a .238 mark (45-for-189) against righties at Tennessee...Registered three-straight multi-hit games from June 24-26, including a season-high three-double affair June 24 at Jacksonville...Hit safely in eight of his first nine games with Tennessee, going 13-for-29 (.448) with four doubles, a home run and seven RBI during the stretch...Landed on Tennessee's seven-day disabled list from July 1-8 with a left calf strain...Played 49 games for Yaquis de Obregon in the Mexican Pacific League...Hit .241 (41-for-170) with 10 homers and 25 RBI. Enjoyed a career year in his first full season in the Cubs organization, batting .261 (128-for-490) with 60 runs, 41 doubles, two triples, 19 home runs and 72 RBI in 133 games with Double-A Tennessee ... earned mid-season and post-season Southern League All-Star honors... Set career-highs in games, doubles, home runs, total bases (230) and slugging percentage (.469)... Led the league in doubles, total bases and extra-base hits (62), while his 72 RBI ranked fifth... Was named the Southern League Hitter of the Week for the week of August 26-September 2, batting .304 (7-for-23) with three home runs and six RBI... Batted .304 (31-for-102) with 12 doubles and 12 RBI in 28 May games... Was 56-for-205 (.273) with eight home runs and 61 RBI with runners on base... Posted a season-high four RBI, April 5 at Pensacola, going 3-for-5 with a double... Had two eight-game hitting streaks, May 7-15 and July 22-29... Recorded three-straight, multi-RBI efforts from June 25-28 (six total RBI)... Registered a double in six-straight contests, August 12-17 (seven doubles)... Homered in back-to-back games, June 25-26 and July 26-27... Batted .227 (22-for-97) with six doubles, three home runs and eight RBI in 32 games for Yaquis de Obregon if the winter Mexican Pacific League. Christian, traded to the Cubs from the Rangers on July 31, combined to bat .279 (128-for-459) with 24 doubles, 14 home runs and 68 RBI in 125 games with Single-A Myrtle Beach and Single-A Daytona...Batted .250 (21-for-84) with five doubles, four home runs and nine RBI in 25 games with Daytona. ...Made his Daytona Cubs debut, August 2, and homered in his first two at-bats vs. Fort Myers. ...Combined for 36 multi-hit games in 125 contests between Myrtle Beach and Daytona. ...Led Myrtle Beach in home runs (10) and hit-by-pitches (20) at the time of his trade. ...Hit .326 (43-for-132) with runners in scoring position. ...Logged a .333 (32-for-96) batting average in the month of July. ...Hit .176 (9-for-51) in 23 games for Obregon in the Mexico Winter League. Christian hit .278 (130-for-467) with 30 doubles, 17 home runs, 84 RBI and 32 stolen bases in a career-best 126 games for Single-A Hickory ... selected to both the mid-season and post-season South Atlantic League All-Star Teams...Set career-highs in doubles (30), home runs (17), RBI (84), slugging (.465), runs scored (78), stolen bases (32) and walks (37)....Compiled a season-high 15 game hitting streak, April 17-May 5 ... batted .397 (23-for-58) with five doubles, two home runs and 11 RBI. ...Ranked statistically as the top defensive third baseman in the league after posting a .942 fielding percentage with 20 errors in 346 total chances. ...Started the season strong with a .338 (25-for-74) batting average in April. In his first season in the United States, Christian hit a career-high .314 (59-for-188) with 14 doubles, two home runs and 35 RBI in 51 games for the Arizona League Rangers. In his first professional season, batted .208 (5-for-24) with three RBI in eight games with the Dominican Rangers. December 13, 2018 Yaquis de Obregon placed 3B Christian Villanueva on the reserve list. 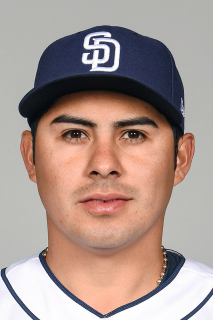 November 21, 2018 San Diego Padres released 3B Christian Villanueva. November 20, 2018 San Diego Padres designated 3B Christian Villanueva for assignment. November 8, 2018 3B Christian Villanueva assigned to Yaquis de Obregon. October 2, 2018 San Diego Padres activated 3B Christian Villanueva from the 10-day disabled list. August 23, 2018 San Diego Padres placed 3B Christian Villanueva on the 10-day disabled list. Fractured right middle finger. September 18, 2017 San Diego Padres selected the contract of 3B Christian Villanueva from El Paso Chihuahuas. May 4, 2017 El Paso Chihuahuas activated 3B Christian Villanueva from the 7-day disabled list. April 6, 2017 El Paso Chihuahuas placed 3B Christian Villanueva on the 7-day disabled list. December 21, 2016 3B Christian Villanueva assigned to El Paso Chihuahuas. December 12, 2016 San Diego Padres signed free agent 3B Christian Villanueva to a minor league contract and invited him to spring training. December 2, 2016 3B Christian Villanueva elected free agency. November 7, 2016 Chicago Cubs activated 3B Christian Villanueva from the 60-day disabled list. October 22, 2015 Chicago Cubs activated 3B Christian Villanueva. October 5, 2015 Chicago Cubs recalled 3B Christian Villanueva from Iowa Cubs. April 17, 2015 3B Christian Villanueva assigned to Iowa Cubs from Tennessee Smokies. April 6, 2015 3B Christian Villanueva assigned to Tennessee Smokies from Iowa Cubs. March 16, 2015 Chicago Cubs optioned 3B Christian Villanueva to Iowa Cubs. October 28, 2014 Yaquis de Obregon placed 3B Christian Villanueva on the reserve list. October 25, 2014 3B Christian Villanueva assigned to Yaquis de Obregon. September 29, 2014 Chicago Cubs recalled Christian Villanueva from Tennessee Smokies. July 8, 2014 Tennessee Smokies activated 3B Christian Villanueva from the 7-day disabled list. July 2, 2014 Tennessee Smokies placed 3B Christian Villanueva on the 7-day disabled list retroactive to June 30, 2014. June 19, 2014 3B Christian Villanueva assigned to Tennessee Smokies from Iowa Cubs. March 18, 2014 Chicago Cubs optioned 3B Christian Villanueva to Iowa Cubs. December 17, 2013 Yaquis de Obregon placed 3B Christian Villanueva on the 7-day disabled list retroactive to December 13, 2013. October 19, 2013 3B Christian Villanueva assigned to Yaquis de Obregon. October 7, 2013 Christian Villanueva assigned to Yaquis de Obregon. September 30, 2013 Chicago Cubs recalled Christian Villanueva from Tennessee Smokies. March 15, 2013 Chicago Cubs optioned Christian Villanueva to Tennessee Smokies. December 13, 2012 Yaquis de Obregon placed 3B Christian Villanueva on the reserve list. November 20, 2012 Chicago Cubs selected the contract of Christian Villanueva from Daytona Cubs. October 9, 2012 Yaquis de Obregon activated 3B Christian Villanueva. July 31, 2012 Chicago Cubs traded RHP Ryan Dempster to Texas Rangers for RHP Kyle Hendricks and 3B Christian Villanueva. July 31, 2012 Christian Villanueva assigned to Daytona Cubs. March 30, 2012 Christian Villanueva assigned to Myrtle Beach Pelicans from Hickory Crawdads. March 29, 2012 3B Christian Villanueva assigned to Texas Rangers. April 5, 2011 Christian Villanueva assigned to Hickory Crawdads from AZL Rangers. June 21, 2010 Christian Villanueva assigned to AZL Rangers. May 31, 2009 3B Christian Villanueva assigned to DSL Rangers2.